OMG!! You've got a new puppy (or are thinking about one)... What next? What's so good about rolling in poo & other stinky stuff? My dog is Barking - Help!! Dog Parks. The Good, The Bad & The Ugly. Many people naturally feel threatened when a dog growls. There is good reason for this. A growl often is the predictor that a bite may follow. So why do dogs growl? Simply put, growling is one way a dog can communicate. This communication usually is the result of a perceived threat – your dog is scared, intimidated, uncomfortable (in pain and doesn’t want to be moved) or stressed. 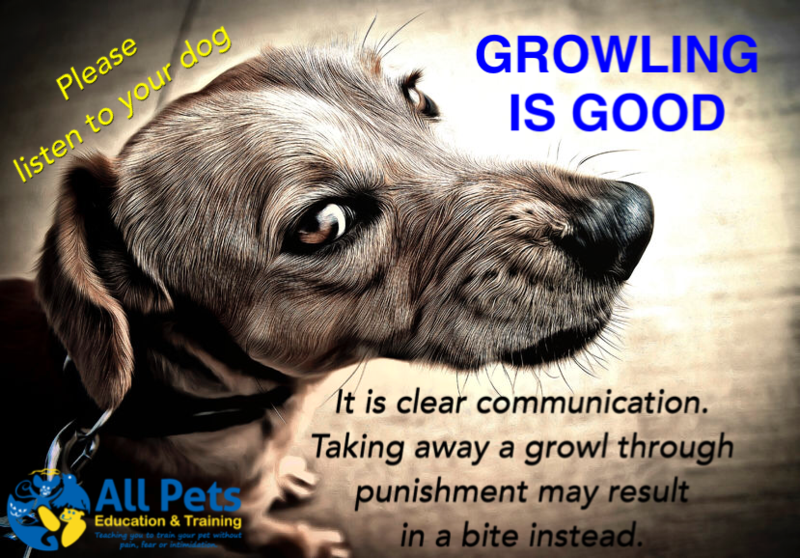 Growling usually results in a distance increase – the distance between the dog and the perceived threat is increased. If the distance is not increased, the next phase is often a lunge, snap or bite. Why might your dog be growling? Dogs will often growl when they are guarding something of value (to them). This could be an old stinky bone, a favoured toy, a person, a bed, a doorway (means of escape) anything that your dog values. These valued items are known as resources. All resources will have differing values from dog to dog. Dogs may also growl when they are fearful, or are being threatened. Many dogs are afraid of many things. This may be people (often small children or unfortunately vets), other dogs, objects (brooms, vacuums, mops etc), being physically abused, moved, or punished. And don’t forget pain. How many times have your hurt yourself, and had someone unfortunately knock, or touch your injury. Did you verbally lash out at them or swear? That is a person equivalent of a growl. If you notice your normally happy dog is now growling anytime you touch or approach a certain area of their body (ears are common), please make a time to see your vet. Why you should never punish a growling dog! This has already been stated above. Growling is just one part of the canine communication system. However it is a very obvious part, and if you punish your dog for growling, you are taking away this communication form. When you take this away, you are not however, changing your dog’s emotional state (usually fearful). Taking away the growl, will only result in the greater chance or your dog lunging at, snapping at or worse biting a person or another pet. Watch your dog in situations that he or she would normally growl (if possible avoid them altogether), and observe for more subtle signs that he/she may be uncomfortable. The first signs are usually body language (refer to the canine body language handout). These signs will include licking of the lips (either quick or slow licks), looking away by moving eyes (whale eye – whites of eyes will show) or turning of their head. Yawning or panting. Your dog may try and move away (escape and create distance), or may freeze and stand incredibly still. Look closely and they will even hold their breath. Your dog may lift his/her lips and then begin to growl. If your dog growls, but the distance is not increased, the next step is the lunge, snap or bite. My dog is growling, what can I do? If you haven’t been able to protect your dog from the perceived threat (sometimes this is not possible) and your dog begins to growl, move away or increase the distance between the perceived threat and do not punish! If a dog is growling at you (whether the dog is yours or belongs to someone else), the best course of action at the moment is to defuse the situation. Avoid shouting or resorting to physical punishment, as these could lead to a bite. Instead, look down and to the side (this tells the dog you're not a threat while allowing you to keep him or her in your peripheral vision). Back away slowly (careful not to trip). Avoid turning your back on the dog if you can help it; some dogs are more prone to attack from the rear. Remember, growling is simply a form of canine communication. If you stop and take a moment to assess why a dog is growling instead of automatically taking the attitude that he's behaving inappropriately, you will be able to react in a calm manner and take action to defuse the situation. 1. Donaldson, J., 2002. Mine!. 1st ed. San Francisco, Calif.: Kinship Communications. 2. Horwitz, D. and Mills, D., 2009. BSAVA manual of canine and feline behavioural medicine. 1st ed. Quedgeley, Gloucester [England]: British Small Animal Veterinary Association. 3. Overall, K., 2013. Manual of clinical behavioral medicine for dogs and cats. 1st ed. St. Louis, MO: Elsevier. 4. Wilde, N., 2006. Help for your fearful dog. 1st ed. Santa Clarita, CA: Phantom Pub. 5. Wilde, N., 2008. Getting a grip on aggression cases. 1st ed. Santa Clarita, CA: Phantom Publishing. 6. Wilde, N. (2014). Why Growling Is Good. [online] The Huffington Post. Available at: http://www.huffingtonpost.com/nicole-wilde/why-growling-is-good_b_4144397.html [Accessed 21 Jul. 2014].